For some mesothelioma families, the danger of asbestos exposure is inter-generational. Parents bring home asbestos dust on their work clothing and transmit it to children. Children in these mesothelioma families sometimes grow up and go to work in the same facilities as their parents, adding to their asbestos exposure. It’s no accident when, as adults, they join the ranks of mesothelioma families. Ronald Ricker grew up in a family where asbestos exposure was all around him. 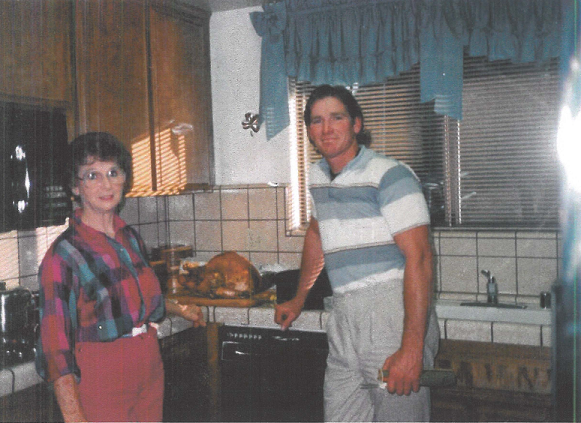 His mother came home and made dinner for the family before she changed out of her work clothes that carried asbestos dust. He went to work for the same company as his mother and later joined his father’s plumbing business and worked in construction with his stepbrother. The Rickers are one of many mesothelioma families. Their story is uniquely their own and it’s also one that many other mesothelioma families will recognize. The story of mesothelioma families like the Rickers starts with a tiny asbestos fiber. Asbestos is a mineral that breaks into small, sharp shards. These tiny bits of asbestos can become airborne during manufacturing or construction. Many workers have unknowingly inhaled asbestos. Mesothelioma usually appears decades after exposure. In Ronald Ricker’s case, almost 40 years had passed since some of the asbestos exposure that led to his diagnosis. None of the workplaces where Mr. Ricker was exposed to asbestos took steps to make him aware of the hazards or protect him or other workers. He never imagined that work he did in his twenties would sicken and kill him in his fifties. Ronald and Suzanna Ricker did not see mesothelioma coming. Though he had worked around products containing asbestos for much of his career, he had no warning of the danger. After several years working primarily in hospitality, his construction work was largely behind him. Neither of them expected to become one more of the mesothelioma families. Mr. Ricker spent his younger years in some of the most beautiful parts of California: the Sierra foothills and Napa. When he was 30, he met the love of his life and the woman who would become his wife. They built a life splitting their time between two other beautiful places: Death Valley and rural Montana. Because of his general good health, no one suspected anything more than a bad cold when Mr. Ricker went to the doctor around Christmastime in 2008 with shortness of breath and a rattle in his chest. The physician sent him home with antibiotics. When that didn’t work, he was given a second round of antibiotics plus steroids. The doctor still thought the problem was allergies and that Ronald Ricker would feel better once he went to his home in Montana and got away from the pollen in Death Valley. Before they went to Montana for the winter that year, the Rickers stopped to visit Ronald’s sister in Northern California. She didn’t know yet that her family would become one of the mesothelioma families, but she knew something was terribly wrong with her brother. At her urging, he went to another doctor, who x-rayed his chest. When doctors told Ronald Ricker that his breathing problems were because his pleural cavity was filled with fluid, it didn’t occur to him to tell them about his past asbestos exposure – because he wasn’t aware of it himself. After the x-ray, doctors drained two liters of fluid from his chest. They found cancer cells in the fluid, but Mr. Ricker still didn’t have a mesothelioma diagnosis. Once he was home in Montana, he had more fluid drained, but still no diagnosis. It wasn’t until after they were back in Death Valley, and after almost a year of breathing troubles, that Suzanna Ricker insisted her husband go see a doctor in Las Vegas. Once he got there, the doctor took one look at his x-ray and immediately sent him to the hospital. Finally, in October 2009, Ronald Ricker got a confirmed mesothelioma diagnosis. Mesothelioma families lose a lot. The biggest loss is the future. Ronald Ricker planned to spend time in nature with his wife and friends. He had started working with horses in Death Valley and looked forward to more years in their gentle presence. Retirement wasn’t one of Ronald Ricker’s plans. He worked as much as he needed each year and took off as much time as he could to go hiking and backpacking with friends. He had no 401(k) or retirement plan. Besides, he wasn’t even 60 yet – he was too young to retire. After his mesothelioma diagnosis, Mr. Ricker knew he needed help – help with medical expenses, living expenses when he was too sick to work, and support for Suzanna after he was gone – the same kind of help that all mesothelioma families need. Ronald Ricker turned to KazanLaw to look back through his complex work and life history and figure out where he was exposed to the asbestos that caused his mesothelioma. Then he would be able to get justice. Mr. Ricker was a member of one of the mesothelioma families with multiple avenues of exposure. He had worked with brake shoes, plumbers putty, and caulk that may have contained asbestos. In his construction work, he was exposed to drywall dust at a time when many drywall manufacturers used asbestos in their products. He removed boilers that may have been insulated with asbestos. Like so many men who worked with their hands in the 1960s and 1970s, Ronald Ricker had many avenues for asbestos exposure. It wasn’t easy to untangle the history of Ronald Ricker’s asbestos exposure. Fortunately, the investigators at KazanLaw have worked with many mesothelioma families. They are experts at teasing out the details from the work history of someone like Ronald Ricker. Those details are the key to getting justice for mesothelioma families. At trial, a jury found that Rockbestos, which made asbestos-insulated wire, had one third of the blame for Mr. Ricker’s mesothelioma. At one of his jobs, he had been required to strip the wires, sending asbestos dust into the air where he could breathe it in. Until there’s a cure, the stories of mesothelioma families never have a happy ending. Ronald Ricker passed away in 2011. For other mesothelioma families – and potential mesothelioma families – awareness may be the best tool. When you understand the risk, you can look for signs of mesothelioma. And an early diagnosis can mean more years to spend with your family.